What Is The Best Method To Judge The Quality Of LED Downlight? Are you confused when you bought dimmable led downlights in your daily life? Many of our customers have referred that they do not know what is the best method to judge the quality of LED downlight. Frankly speaking, it is not good for them to completely believe what the led lighting manufactures said. From an objective point of view, below will help costumers clarify how to judge the quality of LED downlight in an objective way in scientific aspects. When you purchased LED downlight, the appearance of the lighting fixtures should be evaluated first to judge whether its body looks smooth and clean, and the quality seems good. Furthermore, you can also carefully measured in parameter aspects such as the length, the diameter, the cutout and so on. Many of us know that the stroboscopic of downlight will be harmful to people’s vision health, especially for kids. And here tells you a tip to judge the stroboscopic degree: you can plug the power and light the LED downlights, using the camera function of your mobile phone to choose to its luminous surface, and by this way, you can successfully observe whether there is a stroboscopic phenomenon existing. To check light quality, you can simultaneously turn on several pcs LED downlights of the same mode, which is produced by the same manufacturing factory to observe the luminous color and luminance. If there exists an obvious difference between them, it means the product is of inferior quality. From a technical view, the downlights produced by the same manufacturer should have no issues like color and brightness inconsistency. Actually, we found that the effective and easy way to check the thermal performance of lamps is to check the temperature of the LED chip when it is under the working situation. Here we suggested using the "half-hour illumination method" to help measure the exact junction temperature to judge whether the lamp radiator is of good performance. If the numerical value of illuminance of change in the same position differs very far (more than 20%), the radiator system is of interior quality. Hope through the above scientific aspects, you can have a better understanding of several methods to judge the quality of LED dimmable led downlights and lead to better choices of Led downlight in the future. 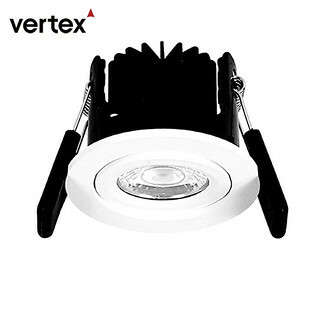 Vertex lighting would always be your best choice in the Recessed COB led downlight, LED cabinet light, fire rated downlight.